Lush green backgrounds, descending waterfalls, and robust mountains provide the backdrop for Ang Lee’s Crouching Tiger, Hidden Dragon. 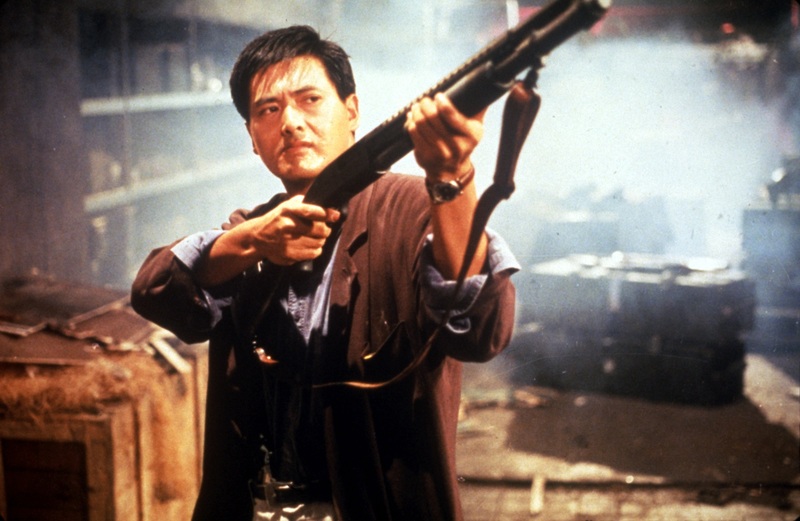 The film stars Chow-Yun Fat in his first martial arts film as Li Mu Bai and Michelle Yeoh as Yu Shu Lien. Long time respected friends, together they must take on the challenge of attempting to avenge past wrongs, guide Jen Yu, (Ziyi Zhang) onto the righteous path, and still have time to declare their long-held feelings of love for one another. This is not an easy task with an enemy lurking around every corner. The film begins in 1778 China with Li Mu Bai returning from a long journey declaring to Yu Shu Lien that he has plans to retire from his warrior lifestyle but before he does, he wants to give his coveted Green Destiny sword to a dear friend as a gift. Jen Yu discovers the sword and although she exhibits all the skill that is demanded of a powerful warrior, as woman she feels that she is held down by societal constraints and decides to revolt to seek out her own destiny. In her own battle within herself, Jen Yu soon discovers that her desire to be a powerful warrior becomes her greatest enemy. In a kind of Chinese fairytale, through detailed character development, an ethereal musical score, and a backdrop of breathtaking scenery in this stunning film, we watch a beautifully told story unfold. 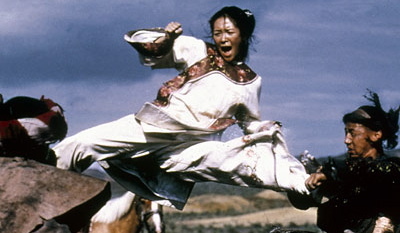 Director Ang Lee has long had a tendency to emphasize the inner strength in his female leads and Crouching Tiger is no exception. In this film, his strong female characters are superbly coupled in contrast with the subtle hints of the social norms in late 18th century China. Yu Shu Lien is a woman who highly regards respect for her elders and teachers, honor as a warrior, and the rules of being a warrior while also trying to be true to herself as a woman. She knows her place but there is something that keeps her from declaring her true feelings for Li Mu Bai. She remains calm, controlled, and clear-headed throughout the film until the moment when her faith is challenged and she finally reaches the point when she feels that her heart can take no more. The intensity of the love stories that Lee presents are done so with such delicacy and tenderness, that you can’t help but fall in love with these stories and how they illustrate how beautifully flawed these characters are. There exists a sense of duty, honor, and pride in both stories that prevents these characters from truly allowing themselves to be given over to love. The inner conflict that each character undergoes fuels the story just as intently as the martial arts scenes do and there is no denying the impact it has on the audience. You feel for the characters even if you do not agree with their motivation. You even find yourself having sympathy for the film’s antagonist Jade Fox, a woman who has only ever tried to become a strong warrior, an able master, and worthy opponent but all the while having the most arrogant of intentions. She never really possesses respect for the knowledge of her elders or fellow warriors and in the end, this lack of respect seals her fate. Many of the fight scenes are perfected with a score by Dun Tan, who was reported to have completed the project for the entire film in two weeks time. If you listen closely, you can hear the flutes actually weeping during the swift poetic dances between Zhang and Chow-Yun Fat. It is something quite extraordinary to behold as they deftly dance over giant bamboo stalks and through tall blades of grass, sternly glaring at one another as they fight. The additional fight scenes between Michelle Yeoh and Ziyi Zhang are encapsulated in movie history forever as some of the most well-choreographed in cinema history. Having no formal martial arts training, Ziyi Zhang used her dancing skills to make many of the fight scenes flow naturally. CROUCHING TIGER, HIDDEN DRAGON screens Monday and Tuesday, July 13 and 14 at 7:00 and 9:30 at the Trylon. Advance tickets are $8.00, and you can purchase them here. 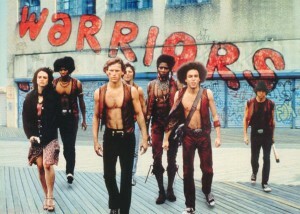 In Walter Hill’s stylized and slightly surreal cult hit The Warriors, the street gangs of New York dress in matching theme outfits, as though they are all British pop groups from the 1960s. There are the Baseball Furies (heavy face paint and pinstriped uniforms); the High-Hats (mimes, basically); the Lizzies (a tastefully trashy biker chick vibe), and the relatively tweedy Warriors themselves, who rock matching sleeveless maroon leather vests. There are hundreds of equally colorful gangs in the city, and one night each gang is invited to send nine delegates to a special conclave being held in the Bronx. It turns out that the charismatic Cyrus, leader of the highly respected Gramercy Riffs (matching leather jackets, sunglasses, bling) wants to propose an unprecedented alliance. All the city’s gangs combined, Cyrus argues, would number in the tens of thousands; they could evict the police and rule New York City. This enticing idea seems, for a moment, as though it will unify New York’s gang culture (the assembled delegates seem to be digging it, anyway), but tragedy strikes: Cyrus is assassinated mid-speech, and in the confusion, the Warriors are wrongly accused to committing the crime. Now being hunted by 60,000 enemies, the gang must fight its way back to the safety of its home turf of Coney Island. Based on Sol Yurick’s 1965 novel, The Warriors takes a simple premise and propels it forward with admirable speed and efficiency. While many directors would choose to make a movie of this kind look gritty and rough around the edges, Hill goes in another direction, creating a sleek dystopian New York that seems eerily depopulated, its deserted streets glistening; only the gangs seem to venture out after dark, tuning into the radio station that delivers coded messages read by Lynn Thigpen in a series of extreme close-ups (Thigpen, incongruously, also plays The Eagles). 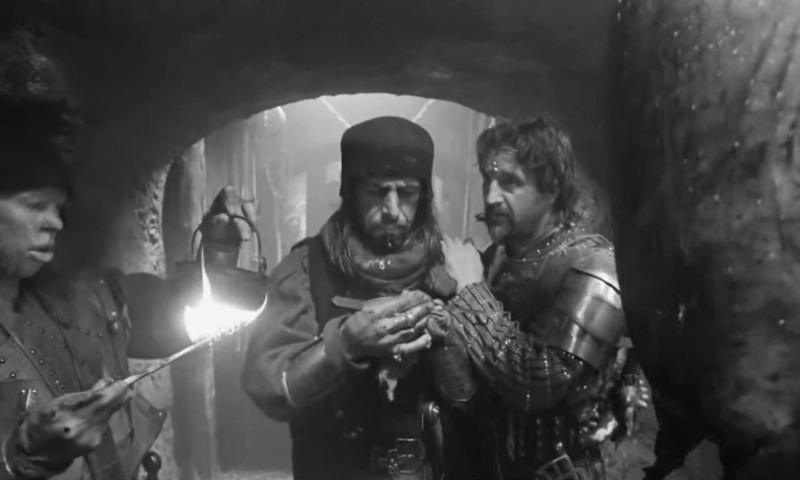 It seems strange today that the movie generated so much controversy upon its release; there was a good deal of worry that it would incite gang violence. And in fact there were some violent incidents between rival gangs that happened to show up at the same theater to see it, causing the movie’s theatrical run to be cut short. But those concerns were clearly rooted in the anxieties of Carter-era America, not in anything you see on-screen. 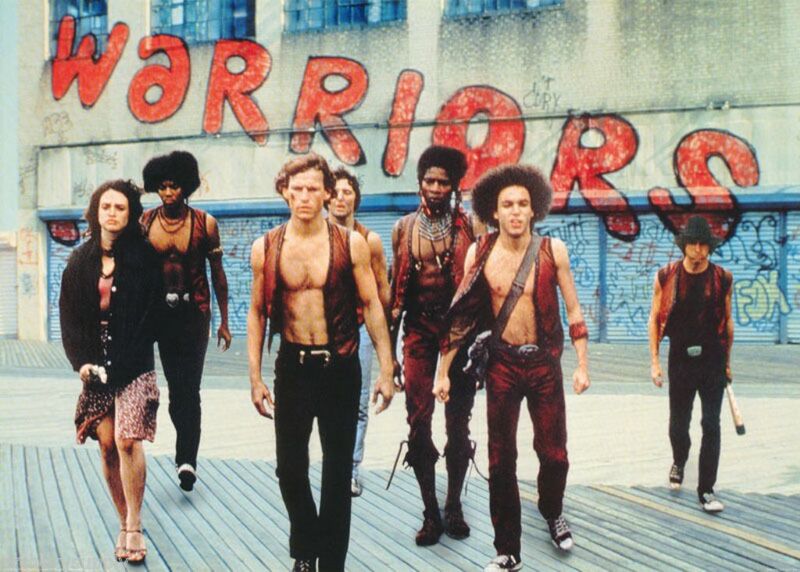 Because the gangs in The Warriors aren’t much tougher than the ones we saw in West Side Story, though they tend to be, on the whole, snappier dressers. THE WARRIORS screens Friday and Saturday, July 10 and 11, at 7:00 and 9:00, and Sunday, July 12 at 5:00 and 7:00. There will also be a special 10:00 am screening on Saturday, July 11 with a book club discussion of Sol Yurick’s novel The Warriors to follow at Moon Palace Books around the corner. Advance tickets are $8.00. and you can purchase them here. Celebrate Independence Day the right way – with “Earth Vs. the Flying Saucers”! From the moment you read its title on a theater marquee, it’s clear that EARTH VERSUS THE FLYING SAUCERS is the kind of movie that means business. This economical little thriller imagines aliens from a dying solar system attempting to conquer our planet, and they are not the sort of adversaries who mess around. First they contact an Earth scientist (Hugh Marlowe) to ask for a parley; when that overture is ignored, they stage a brutal attack on global military installations. 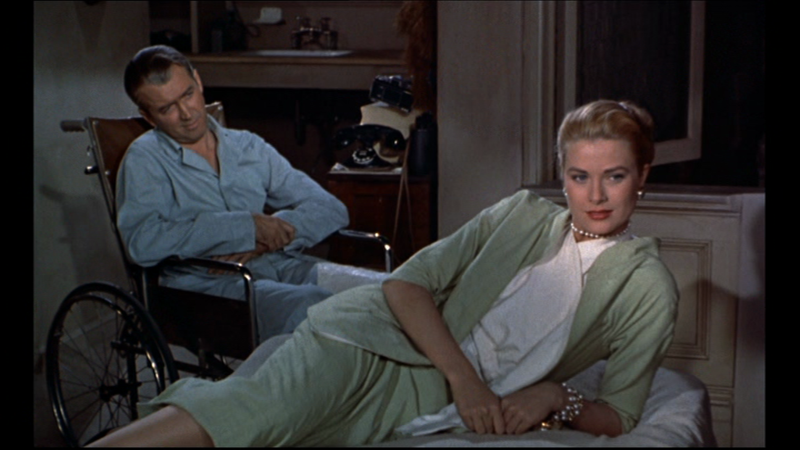 Then it’s off to Washington, D.C. to demand our unconditional surrender. What will we do? What’s that you say? The invaders possess technology hundreds of years in advance of our own, and we don’t stand a chance? Pull yourself together, hippie! American grit and know-how is a match for any threat — no matter where it comes from. But can we defeat the invaders before we — not to mention the most iconic monuments in the nation’s capitol — are wiped out? This was the second of three collaborations between producer Charles Schneer and special effects master Ray Harryhausen, and while it lacked the Technicolor polish of 1953’s War of the Worlds it’s still one of the best alien invasion movies you’ll ever see. Its fast-placed plot and zeal for destroying D.C. landmarks was aped four decades later by the bigger-budget but vastly inferior Independence Day (1996). EARTH VS. 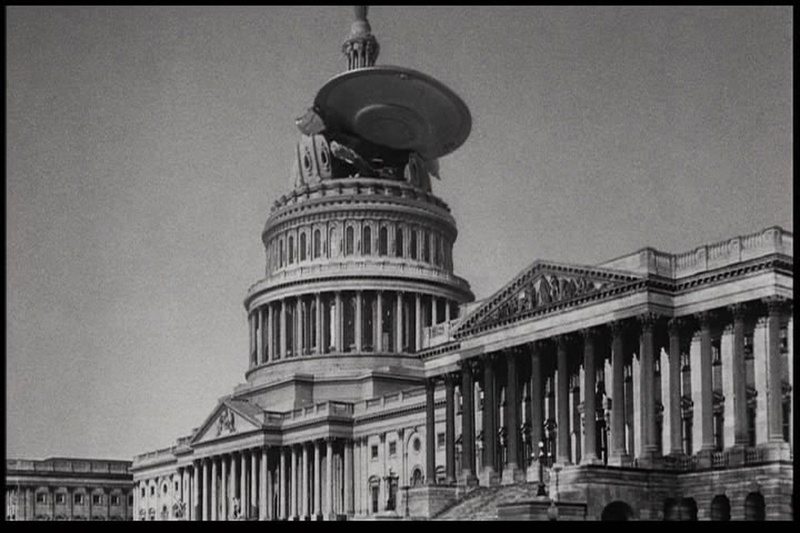 THE FLYING SAUCERS screens Friday and Saturday, July 3 and 4 at 7:00 and 9:00, and Sunday, July 5 at 5:00 and 7:00 at the Trylon. Advance tickets are $8.00, and you can purchase them here.